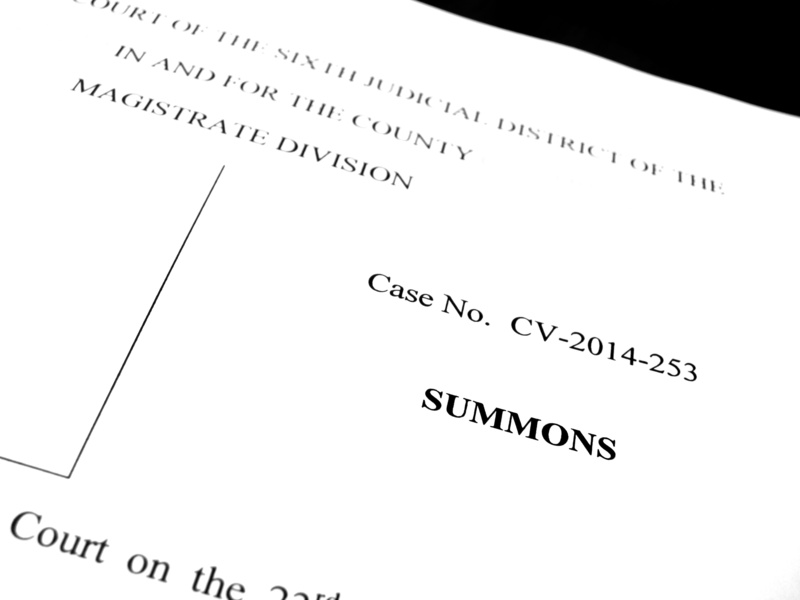 Service upon a defendant means that these papers have to be formally given to the defendant. This is so that there is proof that the defendant has actual formal knowledge that she is being sued for divorce by her spouse. To avoid sewer service, that's why. Here's how it was described to me in 1980 by my law school Civil Procedure professor, Professor Joel Gora. The business hired a lawyer. The lawyer prepared and filed with the court 100 separate complaints seeking money damages against the 100 different customers who owed the business money. The complaints were sent to the court and received a docket number after they were filed. The 100 complaints were then returned to the lawyer. The lawyer hired someone to serve these papers personally upon the defendants. The process server came up to the lawyer's office with a large brief case, received the 100 complaints, and went downstairs. The process server then went over to the sewer in the street and dumped the 100 complaints in the sewer! The process server then went back to his office, filled out 100 different affidavits of service swearing that he had served the various defendants, and returned those affidavits, filled with lies, to the lawyer. The lawyer, not knowing that these documents were fraudulent and not knowing that the complaints had really not been served upon the defendants, filed these affidavits with the court as proof that the defendants in 100 different lawsuits had all been served. All of the defendants failed to answer the complaints against them because all of the defendants never received their complaints; ie, they were never truly "served." Thus, the unknowing lawyer received 100 judgments against 100 different customers and started taking assets of these people away to satisfy these judgments in favor of his client., even though none of the defendants had been properly "served" with the court papers. Since that time, the Courts have realized how critical it is to justice that someone suing someone else properly "serve" the lawsuit upon the defendant so that the defendant has a fair chance to respond to protect himself. To avoid sewer service, the New Jersey courts have come up with the affidavit of service rule that requires a detailed affidavit of service be filed with the court after a defendant has been served. This affidavit requires detailed information about who was served, what that person looks like, and similar information. But how exactly is it done? That is what a new client recently asked me. "Can I do it myself?" "No," I responded. "But here's what we can do." The first way that these papers can be transmitted to the defendant so that everyone is sure that the defendant has been served is if the defendant has a lawyer, then the plaintiff's lawyer can simply ask the defendant's lawyer, "Hey Bob, will you accept divorce papers on behalf of Mrs. Smith?" The answer is almost always an unwavering "yes." This is because the defendant's lawyer understands that she can save her client emotional agony by accepting the papers on the client's behalf. The second option is for your lawyer to hire a process server. The process server's function is to pick up the papers from your lawyer and to personally deliver them to your spouse. The process server may stake out the house where your spouse lives or follow your spouse to a food store, pharmacy, work, or wherever. The process server would, at the appropriate time, approach your spouse with the papers and say something along the lines of, "Mrs. Smith, I have papers for you." The process server would then hand the papers to your spouse, and your spouse has thus been properly served under New Jersey law. The process server would then fill out paperwork describing your spouse's physical appearances, your spouse's approximate age, and would forward these papers back to your lawyer. Your attorney would then forward this document, called an affidavit of service, to the court as proof that your spouse has been served. The third way that your spouse may be served with the summons and complaint for divorce would be by agreement between you and your spouse. You might say to your spouse, "Listen, I have hired a lawyer and we have filed for divorce. We want to keep things as amicable as possible. With that goal in mind, my lawyer would like to send these papers directly to you, but my lawyer has to have proof that you received them. Otherwise we cannot go forward in court. Will you sign a statement indicating that you received the summons and complaint for divorce once my lawyer sends them to you, so that I don't have to have a process server track you down and serve you personally?" If your spouse agrees to this procedure, then your divorce lawyer will forward the papers directly to your spouse along with an acknowledgment page for your spouse to sign indicating that she has received the papers. These are the three most common ways that your spouse can be served with a summons and complaint for divorce in New Jersey. All three methods end up with the same result: your lawyer ultimately receives an affidavit from either the other attorney or your spouse or the process server indicating that your spouse has been properly served with a summons and complaint for divorce. Why is it important to prove that your spouse was served with divorce papers and the exact day that your spouse was served? It is important because your spouse has exactly 35 days after being served with the divorce complaint to file a response. What happens on the 36th day? On the 36th day, if we choose to be aggressive, we can ask that the court enter default against your spouse. This would have the effect of the court essentially closing the courthouse door to your spouse for the most part and allowing us to proceed with your case without your spouse's participation.